Herkimer Row Houses. Photo Credit: The Pratt Center for Community Development. 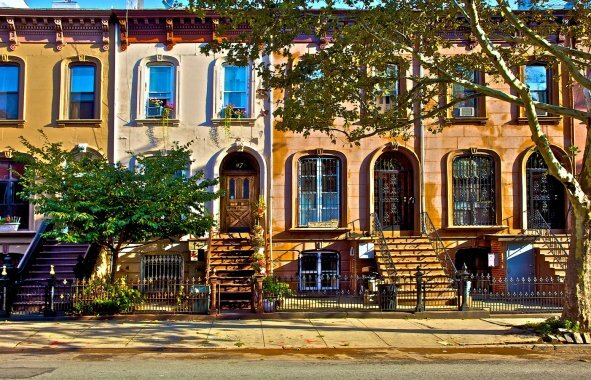 Most neighborhoods in New York City have a characteristic housing type, whether that’s brownstones in Park Slope and Bedford-Stuyvesant, two-family bricks in Ridgewood, or single-family wood-frames in Flatbush. As New York City was developed in waves, a builder would buy blocks of land and duplicate the same housing construction over and over again. This repetition gave neighborhoods their identity, and added beauty and aesthetic diversity to the city. And in the 21st century, vestiges of this historical culture of building present an opportunity to reduce greenhouse gas emissions. Although these buildings are not New York City’s most egregious energy wasters, they account for 17% of the city’s carbon emissions. There are over 650,000 1-4 family homes in New York City. These small homes are a surprisingly important source of housing for low-income New Yorkers – 78% of 1-4 family homes are in low-to-moderate income census tracts and their preservation is critical to addressing the City’s housing crisis. The repetition in the city’s housing stock creates an opportunity to preserve both the structural integrity and the affordability of the housing by increasing its energy efficiency and lessening homeowners’ utility costs. Similar houses built with similar materials and technologies are likely to need similar energy retrofit measures. Developing a standard package of energy retrofit measures could be a game changer. Historically, in New York City, 1-4 family homes have had a very low participation rate in energy saving programs, and thousands of low- and moderate-income residents in communities burdened by energy costs and an outdated building stock have struggled to secure retrofit financing and take part in these programs. The programs are difficult to understand, time-consuming and often not a good fit for the City’s building stock. A standard package based on building type could streamline the installation process and reduce costs by eliminating the need for home energy audits, which are costly and time-consuming, yield no direct energy savings, and create cumbersome paperwork for contractors and homeowners. Audit reports are also difficult to understand and can make recommendations for measures that are ineligible for financing. By eliminating audits, a standard retrofit package can make it easier for community- based organizations to ramp-up retrofits in their communities, and easier for homeowners to access retrofit financing and generate more retrofitting jobs for local residents. A standard package also increases the possibility of savings by aggregating batches of similar homes clustered in one neighborhood: imagine dispatching one truck with all the needed building materials to perform retrofit installations for the whole block. This would reduce material costs and contractor overhead while directing savings toward homeowners. While New York City is our testing ground, this standard package approach could be implemented in cities across the United States. Over the past two years, Pratt Center for Community Development worked with building contractors, city and state agencies and utilities to create a standard package for the row house, one of the most common housing types. In January 2016, Pratt Center launched its EnergyFit NYC pilot (www.energyfitnyc.com) funded by the New York City Council to test the standardized measures approach in 2-family, gas-heated, attached, masonry homes built before 1930 across all five boroughs. Through mapping, we have identified nearly 25,000 homes that are eligible to participate in the pilot across New York City. Many of these homes are in low-to-moderate-income neighborhoods, and a standardized energy efficiency package would provide a low-barrier solution in tackling high utility costs, home health and safety issues, and the effects of climate change. Over the next year, Pratt Center will implement and measure the impact that retrofit measures have on energy consumption and costs for a sampling of homes. Preliminary findings suggest an average savings of 13% in home energy usage. If results show consistent benefits, we will have a workable model to dramatically transform how the State, the City, the utility companies, and the home contracting industry implements energy efficiency in New York’s small homes. Post by Adam Friedman, Director of the Pratt Center for Community Development.